PROJECT SUMMARY: Southern Lights always looks to bring out the best in each property. The red brick from the homes exterior, helped give this property a nice warm and inviting feeling for its guests and those that pass by. Uplights into Crape Myrtles and Cherry Trees. Professional outdoor lighting was desired to help enhance this properties appearance and make the curb appeal “pop” after hours when the sun goes down. Simple architectural lighting across the front of the home and path lighting along the walkway to the back door were were the main sources of interest on this project along with a few specimen trees. LANDSCAPE LIGHTING FOCUS: Front of the home and Backyard were the main landscape lighting focuses of this New Irving Park’s residence in Greensboro, NC. Being on the corner of their street, these homeowners needed to give access to its guests both at the front door as well as the side and backyard entrances. Providing enough light along the walkways was important to help lead family and friends into the backyard without feeling a lack of safety. Once inside the gates, up lighting of the beautiful screened in porch and Cherry Trees helped provide further light guiding you towards the back door. The structure of the screened porch also became a focal feature providing the backdrop and some reflective lighting in the backyard. Important to the homeowners, was the need for security lighting due to their work schedule and their dark backyard. Access to the backyard is needed consistently in the early mornings and late evenings. Southern Lights combined some lighting techniques to keep the lighting balance in check and consistent with the rest of the outdoor landscape lighting effects. Although this lighting design and installation was fairly straight forward, this property has some existing plantings that mature, including the vine trained to grow up and over windows off of the garage. Keeping the plant material properly pruned will be an ongoing maintenance need for these clients to keep the lighting design in tact for years to come and to reduce unnatural shadows on the architecture. 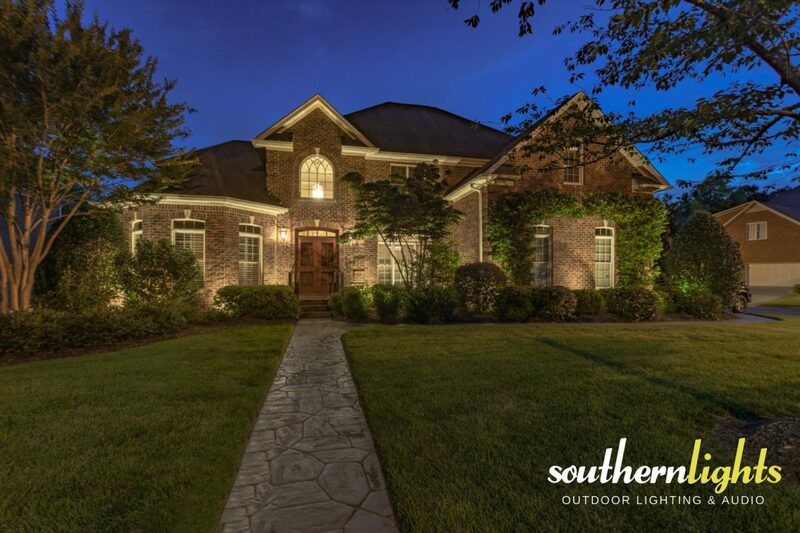 This client ultimately trusted Southern Lights with the lighting designs allowing us to provide them with the most ideal landscape lighting effect with the best lighting fixtures for the space and structures. We think it turned out pretty awesome!